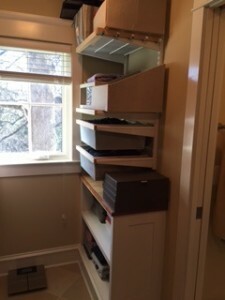 Before photos of walk-in closet. This week the weather got warmer, and we gained an extra hour of daylight – spring might not technically be here yet, but it’s right around the corner. Everyone likes to get a fresh start this time of year – it’s the perfect opportunity to purge what you don’t need, organize what you do, and fill in wardrobe gaps with fresh pieces. 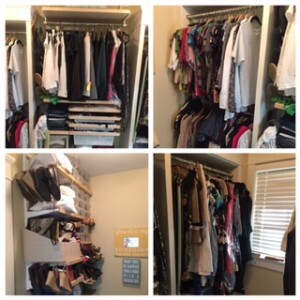 Last week I edited and organized a large walk-in closet at a home in Arlington, Virginia. 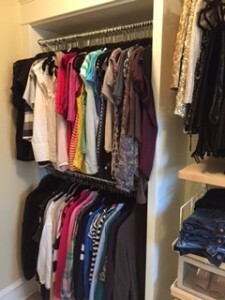 Before photo – main wall of closet. 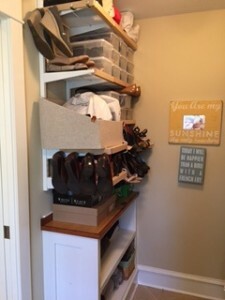 This closet had a lot going for it before I even got started – lots of space, plenty of quality hangers, and already had shelving and organizational drawers and bins installed. This client is a working mother of twins under age four. Time is a luxury for her, and she needed my help deciding what she needed to get rid of, and how she could organize her things in a way that made sense. She was very open to purging – and told me it helped having an outsider gently push her to be honest with herself about items she hadn’t worn in years or had seen better days. One of many donation piles. By the end of the session, we had a LOT of donation piles. Some items were going to the local Goodwill, others to my client’s office for co-workers to pick through, and a few things just needed to be trashed. Once the whole closet was edited, I got to work organizing. I put all like pieces together: short sleeved shirts, long sleeved shirts, skirts, pants, and dresses, and then organized them by color. It’s a lot easier to find the black shirt you have in mind when all the black shirts are in one place. Short sleeved shirts up top, long sleeved on bottom – all organized by color. 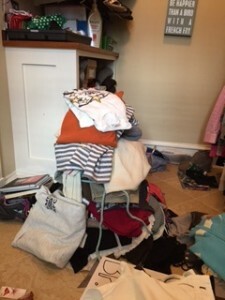 Like I said, this client already had plenty of quality hangers available – especially after purging. (I tossed all the wire hangers immediately – they’re awful!) I just used what she already had, even though some were different colors, there was no real reason to go buy more. 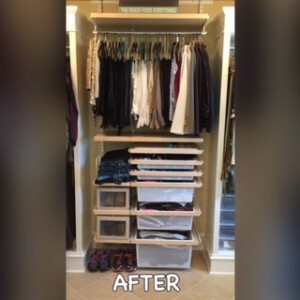 I used the sliding bins and drawers for clothes that don’t need to be hung: workout items and t-shirts, bathing suits, and cover ups. On the shelves I placed her sweaters after I re-folded them with folding paper so they’d hold their shape a little better, along with her sweatshirts. Bins and shelves are ideal for containing items that don’t need to be hung up. The last thing that needed to be tackled were shoes and handbags. She already had storage boxes and racks available for shoes, so I simply placed the pairs she wore most often in the front, and used the clear plastic boxes for special occasion pairs that are worn less frequently but need to be protected. Handbags were stuffed to keep their shape and placed in cloth bags to keep from getting dusty. The bags used the least were put of the highest shelf, and those used more regularly were put on a lower, easier to reach shelf. All in all, this closet edit and re-organization took me about 5 hours. The client was thrilled not having to spend a beautiful Saturday inside her closet, and was instead able to enjoy it outside with her family. After: Main Wall of Closet. 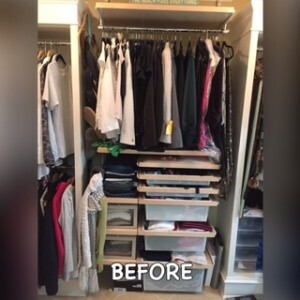 Check out the slide show below for more “Before and After” photos of this fabulous closet. If you’d like to give your closet a spring cleaning, but don’t have the time and don’t need the hassle, contact me for more information.